Occasional Brief Observations: Insisting on perfection? 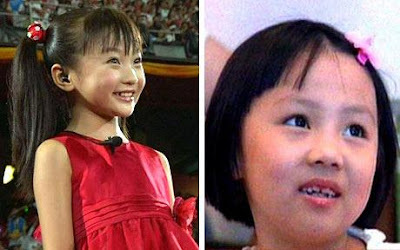 Seems like the Chinese have gone a little overboard... Sure they want to put their best foot forward, but using 7-year old Yang Peiyi's voice while hiding her because her teeth are not perfect? Come on! "The national interest requires that the girl should have good looks and a good grasp of the song and look good on screen, Lin Miaoke was the best in this. And Yang Peiyi's voice was the most outstanding." Who Was Actually Singing as the National Flag Entered the Stadium?